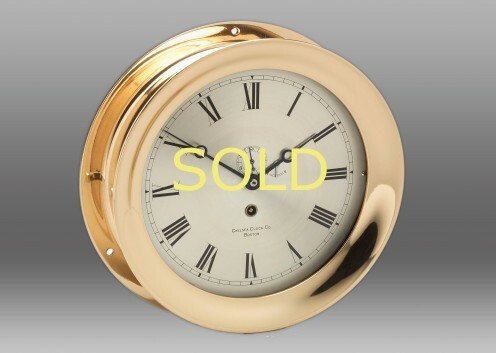 Since 1897, it was common practice for companies in the maritime industry to order marine clocks from Chelsea Clock Company that would accompany their own manufactured products. This clock custom made for Mesa Machine Company is a stunning, living example of this centuries old tradition. Handcrafted from solid brass, this vintage timepiece dating back to 1906 is operated by its original seven jeweled and numbered Model E movement, which has been fully restored and serviced by Chelsea Clock technicians. The clock has a hinged-style bezel, with a hand-silvered dial featuring Roman numerals and moon hands. A rare and beautiful clock, available with custom fitted wall mounting plaque upon request.